After the holidays, winter decorating can be difficult. If you are like me, you enjoy that blank-slate period at the beginning of the year but also have a need to accessorize just a little. 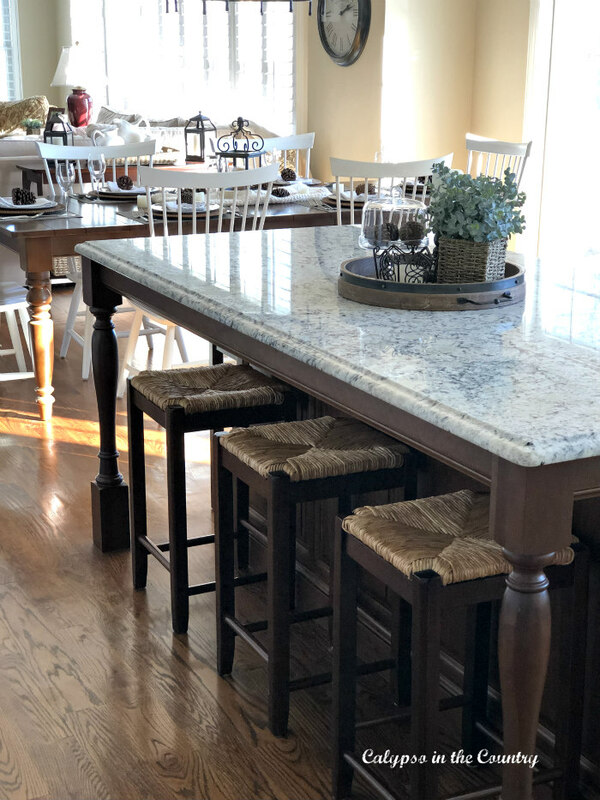 This week, I decided to embrace the winter season and add some seasonal items to my kitchen. 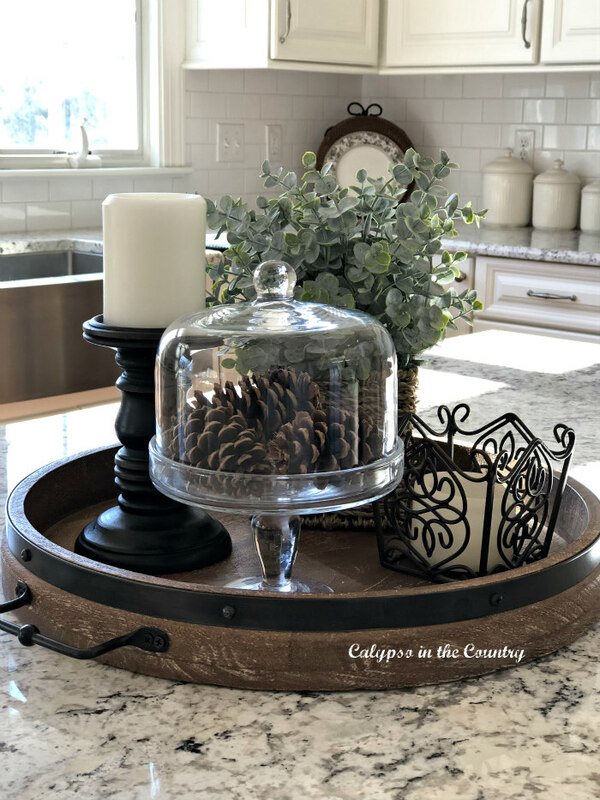 Using trays to group items is an easy way to create a winter vignette. Most people have plenty of pine cones and candles so bring them out and display them! Take a break from all the vibrant Christmas colors and use calm colors for winter. As always, a touch of greenery looks pretty. Warm woods definitely keep things feeling cozy in the winter months. Once again, you can’t go wrong with a pine cone or two. 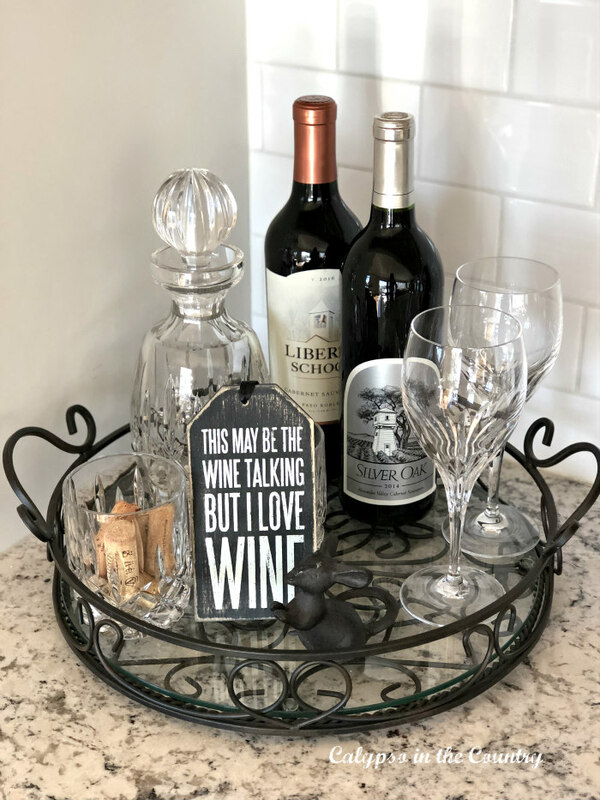 And a bottle of wine or two doesn’t hurt either! 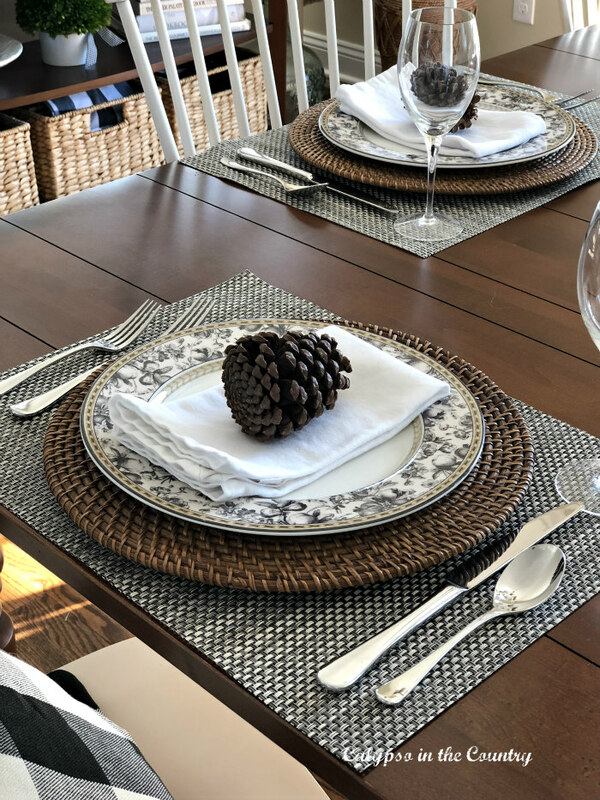 Once again, a pine cone on a table setting adds an easy winter touch. 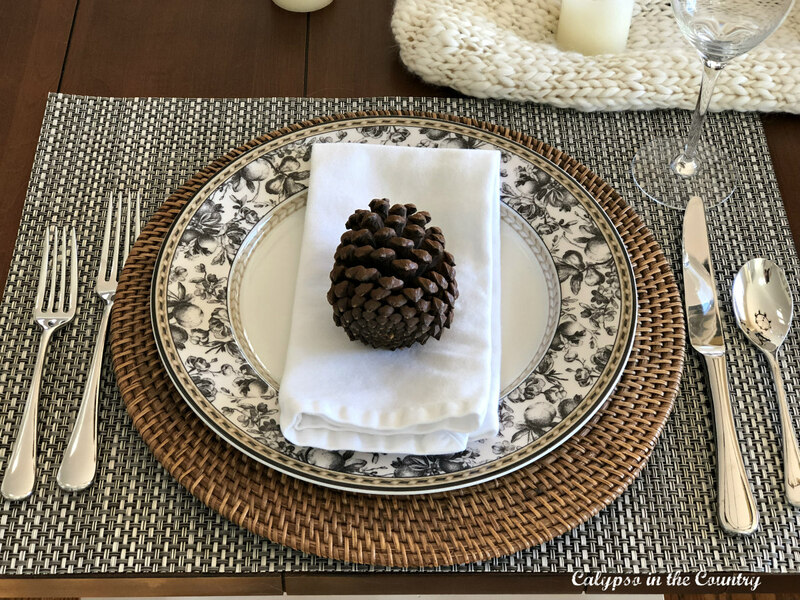 I used a fluffy winter scarf in my centerpiece…and once again pine cones and candles. Now, if only the sun would continue to shine for a few consecutive days! Is it just me or have we had the strangest winter weather this year? From crazy storms to cold to mild…no wonder it’s hard to decorate (and dress) for winter! 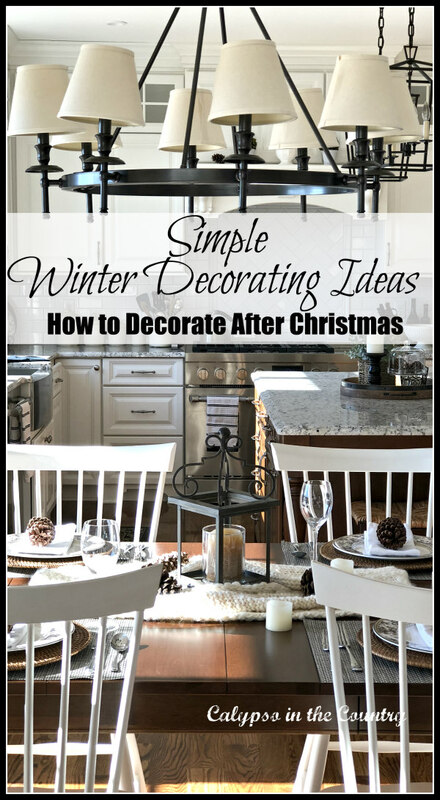 Hopefully, I provided you with some helpful winter decorating ideas you can you in your home! 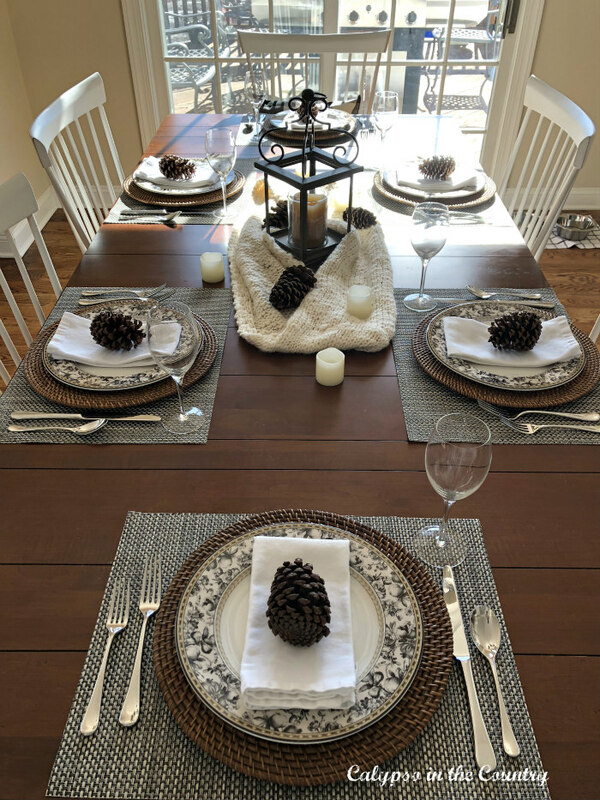 If you are still looking for more winter decorating inspiration, here is another winter table setting from a few years back or read these winter decorating touches. Stay warm! I have provided sources below for your convenience. Please note that this post contains some affiliate links and I will receive a small commission if you make a purchase after clicking my links (at no additional cost to you). Placemats – (Homegoods) but these similar vinyl place mats come in several colors. China – (Royal Doulton-Provence Noir – discontinued) although a simple black and white china would be pretty too. Rattan Chargers – Pier One Imports but these rattan chargers are very similar. 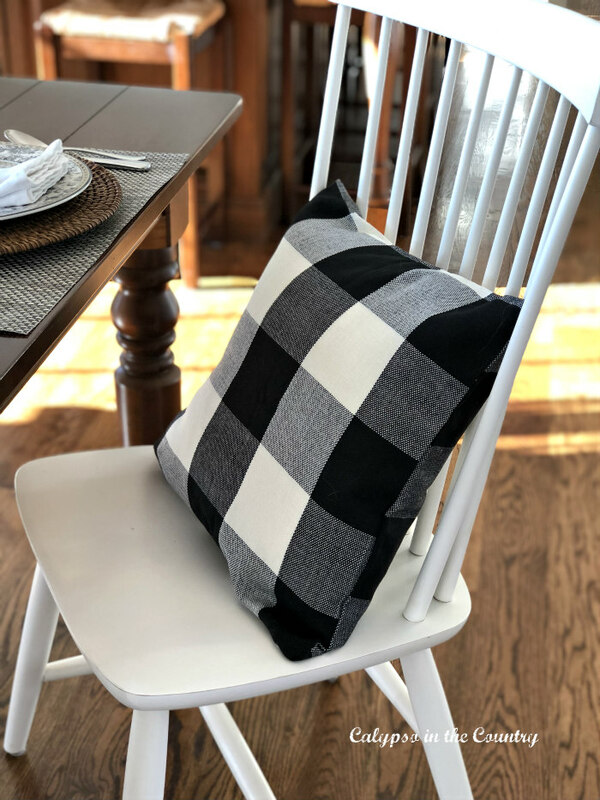 Black and White Buffalo Check pillows – these black and white pillow covers are the exact ones I have and they come in several colors and sizes. How are you decorating your home this winter? Everything is really lovely but I especially love the pine cones in the cake safe! 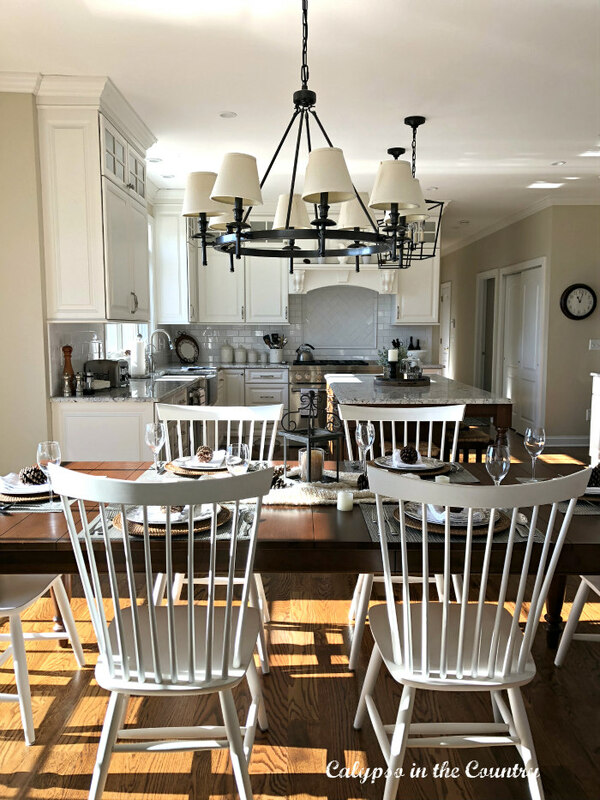 I’ll remember some of these ideas for the cottage this summer. Pine cones can be always! Thanks so much! 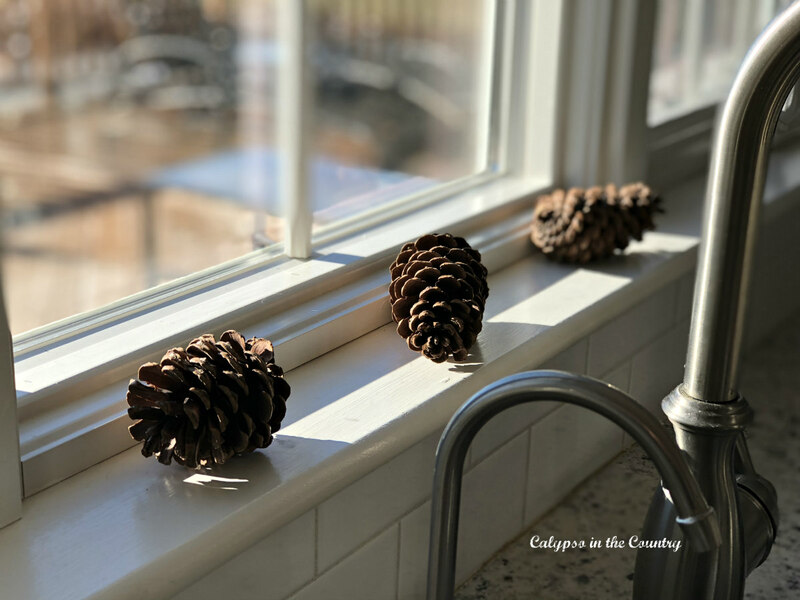 And yes, I agree that pine cones look great all year! Your home looks beautiful, Shelley. I have pinecones scattered around the house as well. Enjoy your week. Thank you! It definitely feels refreshing to have all that Christmas stuff packed away! Enjoy your week! Definitely look like winter! Pinecones make a great display at this time of year. Beautiful winter displays! 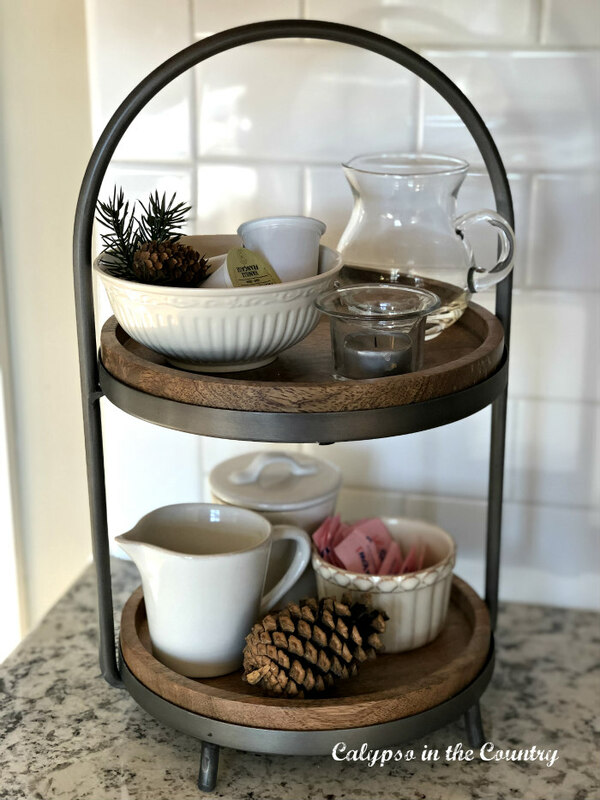 I just love the rustic look of the trays. Thanks Tanya! I think I bought them on the same day. World Market has had some great things recently! 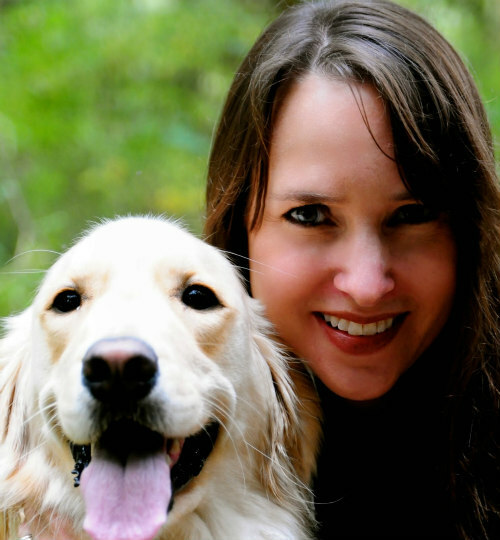 Beautiful, Shelley! 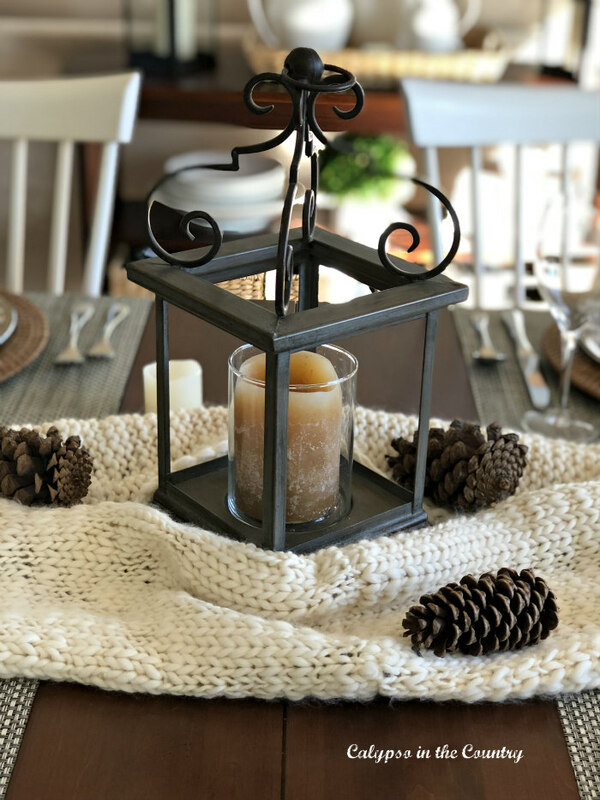 You can’t go wrong with pine cones and candles for winter decor. Thanks Paula! I have so many of them so it makes winter decorating so easy. Thanks for swinging by to comment! So beautiful! 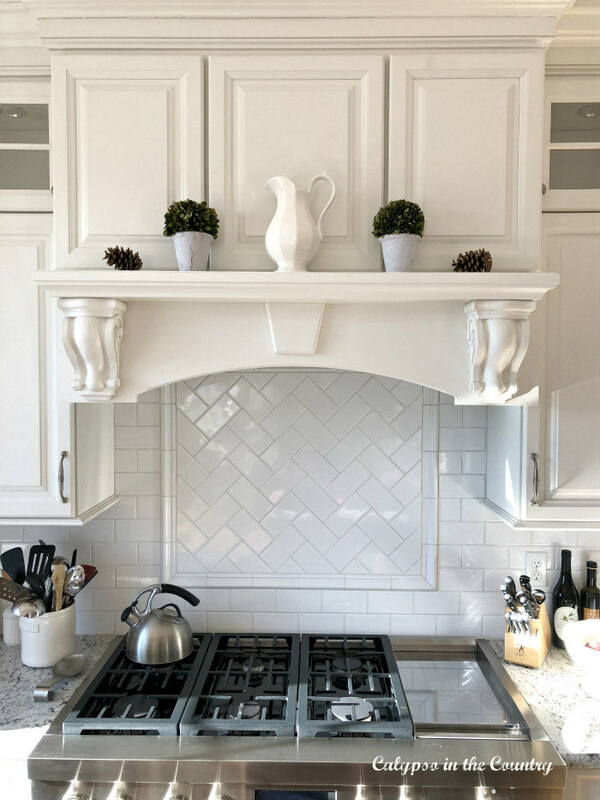 I really love your decor posts! Thanks Kay! What a nice thing to say! How clever of you to use a winter scarf as part of your tablescape! Living in Waco it reminds of a “ thinking outside the box “ style Joanna Gaines would use. If you have never been to the Silos you would enjoy their displays, and I would say you are equally talented! Thank you, Diane. What a sweet thing to say! No, I have never been to Waco but would love to go some day! Thanks for stopping by and enjoy your weekend. 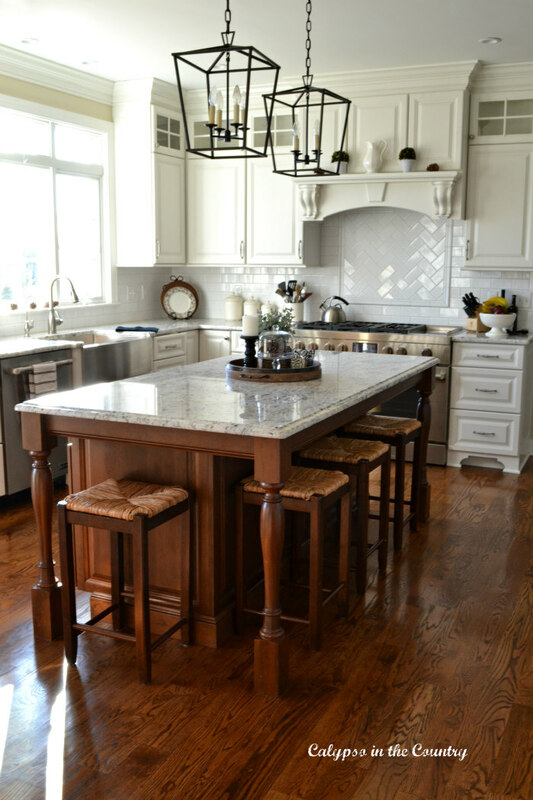 You kitchen absolutely stunning! I love your winter touches! Thanks so much, Amber! It’s sometimes hard to come up with decor this time of year but simple always works! Thanks for stopping by! Yes, they work with almost anything! So beautiful! I feel like I totally needed these decorating ideas because my house looks so bare now that Christmas is over. Have a Good weekend! Thank you so much, Patty! I always find this time of year difficult to decorate…glad I could help! Enjoy your weekend!